The Ibanez V200S solid top acoustic guitar is a no-brainer for those who love the sound of a dreadnought guitar but who are working within a limited budget. Guitar reviews for this solid little number will show that it is a great beginner guitar, especially since it will take you right through your intermediate level playing with absolutely no problem. Built on the popular dreadnought body, this sturdy dreadnought has a solid spruce top and mahogany back and sides which combine to give the V200S a depth, volume and warmth that you do not often find in cheap acoustic guitars. It also has a great tone; a crisp clarity on the treble notes that warms into a rich, almost honeyed tone as it drops into the mid-range and lower bass notes and a volume that will take you by surprise. The deep dreadnought body and its wide shoulders make this quite the big guitar, both in sound and in actual size. In fact, it may be a bit much for smaller and younger players to handle, but it certainly is tempting to try to play anyway, especially at the price! At just ~$199 this guitar is a steal, especially for those guitarists who are just starting out and who want a good quality instrument on which to learn. And it’s black on black color scheme make for an eye-catching instrument. Watch out for the pickguard though, it tends to start separating from the body of the guitar fairly quickly, which can ruin the look of your guitar though it shouldn’t affect the sound in any way. Also, be prepared to replace the strings that come with the V200S as the factory-included strings tend to give the V200S a bit of a buzzing tone on the frets. Heavier strings will clear this up fairly quickly however. All in all, the Ibanez V200S is a good guitar that will hold up well for the beginning and intermediate player alike, and with a price that will keep you happy. Plus there are few black guitars to choose from, and this is one of the few good options! See more great guitar reviews at Ibanez Acoustic Guitar. Join in and write your own page! It's easy to do. How? 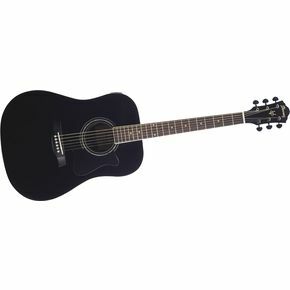 Simply click here to return to Ibanez Acoustic Guitar.